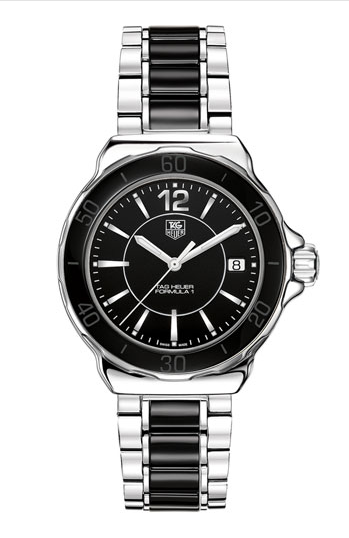 The ladies Formula I watch from Tag Heuer is a chic and sporty timepiece. This is a watch you can wear on formal occasions and to the office, and you can even sweat in it and its rust-resistant stainless steel strap will still look gorgeous. A unique feature of this watch is the combination of porcelain and stainless steel which complete the bezel and strap. These materials give the watch a sophisticated appearance while providing time-honored Tag Heuer quality. While the watch’s case is primarily made of sturdy stainless steel, it has a black porcelain inlay bezel which displays numerals 10-60 in grey. The watch dial is also black with silver stick hour markers and a numeral at 12 o’clock. Although the hands appear to be silver as well, the hour markers and hands are luminescent so the time can be easily deciphered in the dark and underwater. The dial displays hour, minute and second hands. Between each hour marker there are four smaller markers which assist accurate reading to the minute. The three o’clock mark also contains a small aperture displaying the date. The Tag Heuer trademark logo is located beneath the 12 o’clock mark, and written again below the center with the Formula I name. In very small lettering across the bottom of the watch face is the “Swiss Made” logo as well. Although the Tag Heuer brand originated in Switzerland, the logo assures that the majority of the watch’s parts were manufactured and assembled in Switzerland. Thus, the movement is Swiss made. This watch’s movement also contains eight jewels, which aid the watch’s accuracy and increase the lifetime of the piece. The movement is battery powered quartz. This type of movement not automatic and the batteries usually require replacement roughly every two years. It is water resistant up to 200 meters or 660 feet. The case has a screwed in back and you can swim, shower and dive while wearing this watch. For the best appearance and durability, you should pat it dry with a soft towel after it gets wet. This simple precaution will prevent any rusting which could occur after extensive underwater wear. This timepiece is truly a work of art that you will find reliable, durable and chic!